Librarian Christine Kiddey discusses The housewife’s guide to making and mending published in WWII and the amusing annotations left my its owner. Mending is something of a lost art in this day and age – clothes are plentiful and can be bought cheaply. But in England in the 1940s it was an absolute necessity, given that new clothes were limited by the number of clothing coupons you had. By 1945 an adult was down to 24 coupons per year – a new lined woollen coat cost 18 coupons. It was 1949 before clothing rationing ended, well past the end of World War II. 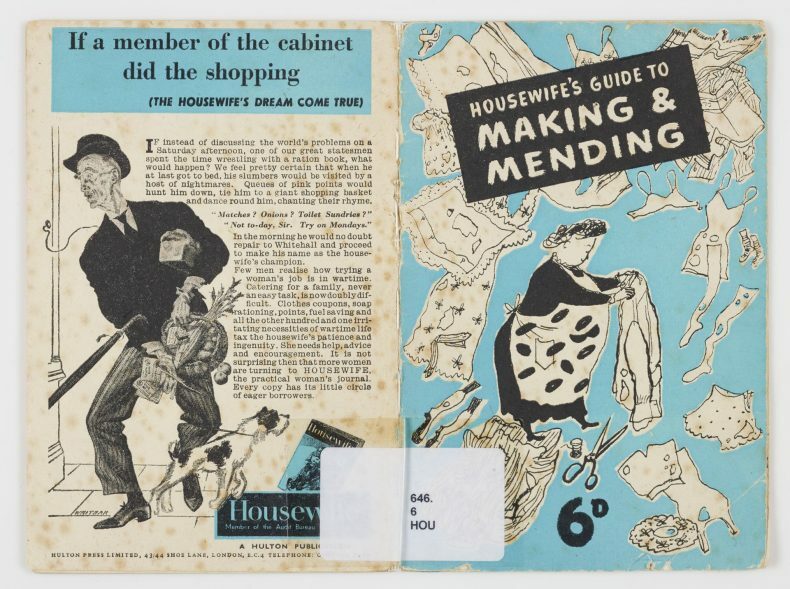 Housewife magazine gathered up its articles on make-do and mend and published them as a booklet, in response to popular demand. The library’s copy of the The housewife’s guide to making and mending was annotated by its original owner, a lady by the name of Kiwi Longwill. On the title page she wrote “This little book was a godsend in the lean war years when coupons were so few. Work was constant and hard, and clothes wore out more quickly than usual because of the fact that they had to be washed so often because one had nothing else to wear”. 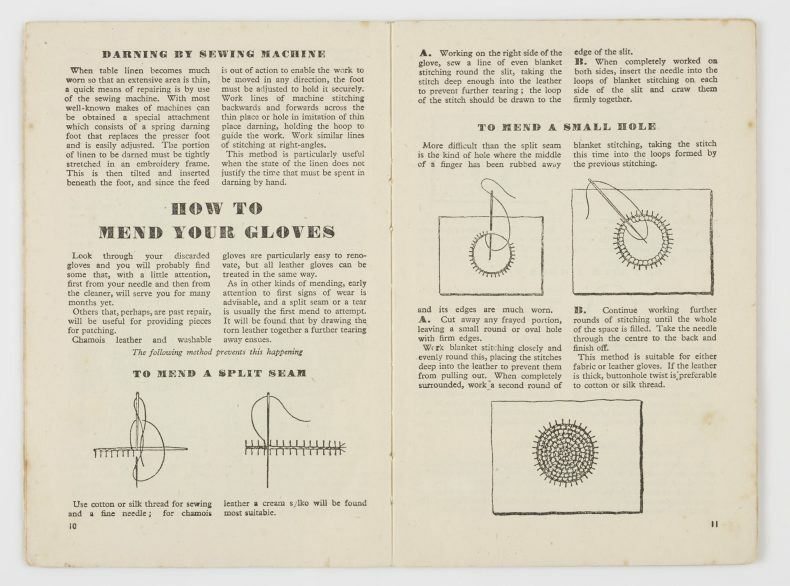 The Guide gives detailed advice on patching – on woven undergarments, outer garments of silk or print, tailor’s patch for serge or tweed, straight tears, triangular tears, elbows worn thin, trouser turn-ups and cuffs (“lousy job”, Kiwi thought), household linen, gloves. It also has helpful hints for recycling. 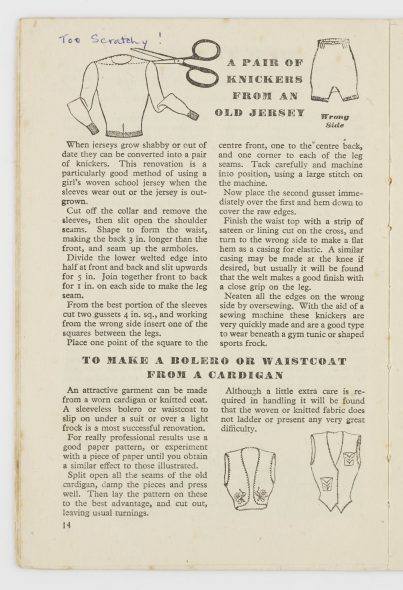 “Refronting your husband’s shirt” worked for Kiwi, but at the bottom of the page she adds “All shirt front and no tail!” She doesn’t have anything to say about smocking or “Pyjamas from Daddy’s”, but there’s no doubt about what she thought about re-footing stockings – “B- awful job”. Perhaps someone can tell us more about Kiwi Longwill? In 1942, when she wrote her name in the book, she was living in Shipley Avenue, Newcastle-on-Tyne. Kiwi Longwood was my great aunt. My grandmother’s eldest sister. Wow what a fabulous lady. I have a photo of her talking on the BBC about many things to do with parsnips. She had gone to London with her husband Alex Longwill who had been seconded for the duration of the war. Aunty Kiwi nursed during her stay. She regaled us with many of her adventures:keeping us entertained. Immense fun to be with. She did have a very long and productive life and was loved by everybody. I’m sure that’s her. I wondered if we might hear from someone in her family, or who knew her. It would be interesting to know how she came to be living in Britain during the war. You, me, and most other people, I suspect! “Too scratchy!” – I can only imagine. Looks like there is a related MS collection at the National Library. She seems to have been someone who was very aware of home economics. We know she died in 2007, so she lived a good long life. I still have some coupons from WW2, must look them out… I was born in 1943 in London, during the War, my sister was born 1941 in Belfast, Mum was from near Belfast Northern Ireland. I think the coupon book I have or ration book, is for food, I can vaguely remember going shopping with Mum and using them, those were the days no such things as a supermarket, you went to a shop to buy groceries, you only took one basket for the weeks groceries!! Butcher was in his own shop,. similar as green groceries, and the Fish Shop… thanks for the memories..
Hard to imagine the week’s shopping in a basket rather than a supermarket trolley. In some ways it was probably a healthier diet, even if it was more limited. Much less sugar, I’m sure. Nice to hear from you! Those broadcasts would have been fascinating now. Probably all about eggless, sugarless, butterless wartime cooking to go with the patched clothes, I guess.